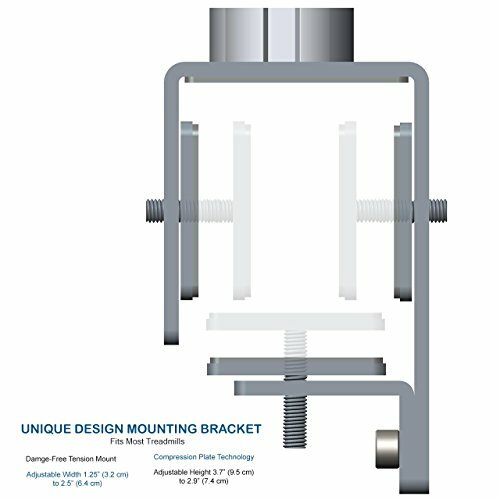 UNIVERSAL COMPATIBILITY The adjustable clamp quickly & easily attaches to most treadmill frames with the included pressure plates. It's the easiest no-tool, zero damage install! ADJUSTABLE DEVICE CRADLE We have engineered the computer workstation desk with adjustable brackets, which means it easily accommodates laptops & tablets of virtually all sizes. Please see our size suggestion image for more info or send us a message if you have a question not answered here. Note: If your device slips a little or for added security, velcro strips are recommended. 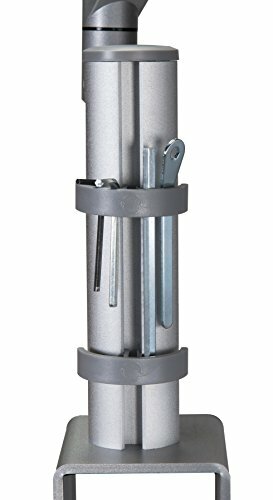 PRESSURE SENSITIVE ARM Gently push down on the platform to lower the amazing patented Dragonfly arm to a comfortable position. 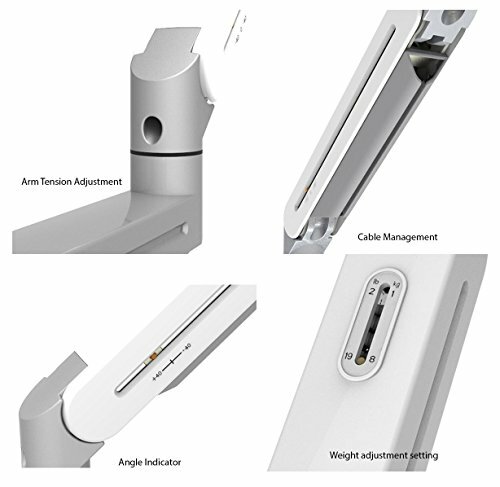 Once released, the arm automatically raises back to its original position. CABLE MANAGEMENT No more dangling cords! This laptop treadmill holder keeps cables discreetly hidden, delivering a clutter-free appearance. Due to an overwhelming demand, these workstation stands are selling fast. Don't miss out. Order yours today. Click ADD TO CART now! DUAL PURPOSES: Never again miss an important email, chat session, or social network update while getting in your daily workout. This clamp on computer treadmill accessory keeps you moving & keeps you working! Unlike other products there's no need to remove it. Just pivot it out of the way when not in use. WORK HEALTHY: Sitting at a desk all day can take a toll on your health & overall well-being. But this exercise work station makes it unbelievably healthy. After all, cardio reduces blood pressure & relieves stress. BEAT BOREDOM: While commonly used as a laptop treadmill desk, this standing workstation mount can also be used with a jogging treadmill when watching TV talk shows, the news, movies, YouTube videos or presentations. 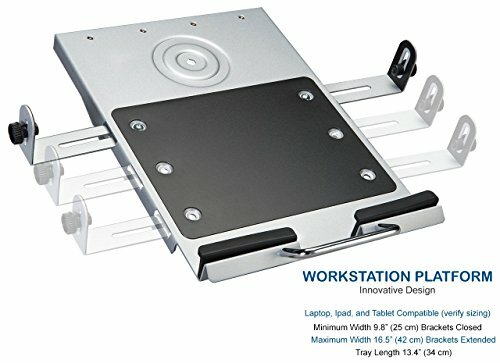 COMPATIBILITY: Unlike your average treadmill work desk, our standing work station is compatible with both laptop computers & tablets of all sizes. This is because the treadmill desk mounting brackets are conveniently adjustable. (Damage-free tension mount hardware included.) SAVE SOME CASH: Don't waste money on a work desk treadmill that has only one use. Make the economical choice. 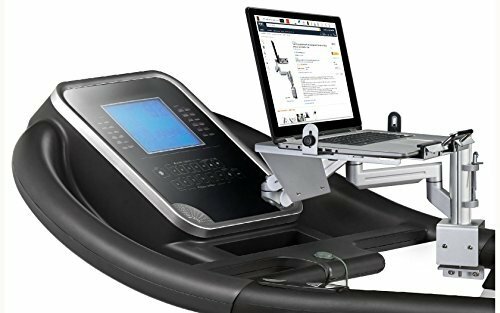 Our affordable workstation attachment is strong & dependable and converts your multi-function treadmill into the workstation of the future! Now you can walk, work, and even run on just one treadmill.